Smee’s Secret won Outstanding Production at the 32nd Annual Calgary One Act Play Festival. (Pictured: Olive (Emma Sinclair) and Pistachio (Kelly Malcolm) with Smee, their cardboard box friend) Photo Credit: Kathryn Smith. What a task to describe The Tighty Whities’ latest show Smee’s Secret. For sure, the clown duo’s award-winning show is nothing short of wonderful. The genius of Smee’s Secret lies in its deceptively simple premise: two clowns help their cardboard box friend complete his bucket list. 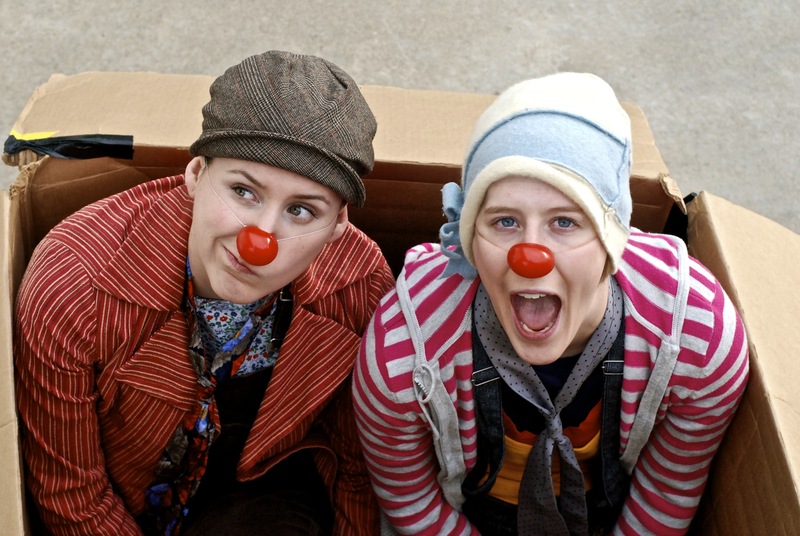 One moment, Olive (Emma Sinclair) and Pistachio (Kelly Malcolm) are caught up in their child-like sense of wonder and imagination; the next their friend Smee feels very ill. Massage, medication, nothing the clowns try appear to help Smee. The total suddenness of it all drives the clowns to figure out something, anything. Uncertainty, desperation, anger, Olive and Pistachio’s emotional journey might ring familiar for any who have experienced loss in their own lives. By dealing with the topic of loss under the guise of a silly clown show, Sinclair and Malcolm catch the audience by surprise, but it is not the sort of surprise that clunks the audience over the head. The reason is that Smee’s Secret is, at its core, a story about friendship. What does it mean to be a friend, especially during hard times? Olive and Pistachio learn that while everything else may fail, the strength of friendship always remains. Sometimes the most important thing we can do for our friends is simply be there for them. So, this is not a show about loss per se; it is a show about how we love and say goodbye to the ones we care the most about. There is plenty of fun, too, in the mix. Through the power of montage (set to the tune of Hall & Oates’ You Make My Dreams Come True), Olive and Pistachio clear the items off Smee’s list in no time. Outside help from the audience is required at one point as the clowns invite an audience member to sit down for a romantic date with Smee. Olive and Pistachio act as chaperones, giving the two pointers along the way in what is a charming little scene. Olive and Pistachio are so easy to fall in love with because of the sincerity Sinclair and Malcolm bring to the stage. And so, it is no surprise that the audience send Olive and Pistachio off to their next adventure with enthusiastic applause. Imaginative, magical, Smee’s Secret delights with its special blend of humour and heart. The Tighty Whities’ Smee’s Secret ran July 31st – August 8th as part of the 2015 Calgary Fringe Festival.